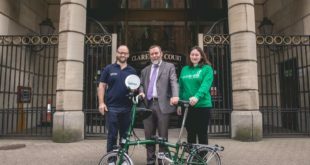 ATG Training and ACT have been playing key roles behind the scenes of the recently launched Barclays Cycle Hire, the firms have revealed. ATG and Cytech have worked with Serco as training partners since the start of 2010, continuing to work with the scheme on technical processes to date. The firms also played a part in the recruitment process for the maintenance staff, finding 29 employees for apprenticeships for the Routine Maintenance Operative roles. Hopefuls were tested on attitude, aptitude and basic fitness. In April the recruits took part in an initital ten-day training programme at ATG’s Cycle Academy in Aylesbury. The newcomers undertook Cytech Technical Two courses, enjoying low teacher to student ratios for intensive training. ATG’s London team of assessors have been working with Serco to mentor the apprentices through to the launch of the hire initiative, delivering additional training as required. The ACT believes that there are growing opportunities for cycle hire throughout the IBD network in London, given the scheme’s prcing focus on short rental periods.